You'll be £25.00 closer to your next £10.00 credit when you purchase Monte Cassino. What's this? One of the bloodiest European battles of the Second World War was that from January to June 1944 for the Gustav Line, anchored on Monte Cassino, famous for its Benedictine Abbey. Better known as the Battle of Cassino, the campaign only ended when Rome was liberated. With General Sir Harold Alexander in overall command, the Allied Army Group in Italy, consisted of Fifth (US) and Eighth (British) Armies. Both were truly multi-national with some 20 allies nations involved. The book recognises the contributions of all elements and flags up the inevitable national tensions and rivalries exacerbated by restrictions of terrain and weather. Allied commanders, using ingenuity, highly effective artillery and sophisticated close air support, finally triumphed over their formidable German adversaries. Cassino: January-June 1944 examines the campaign from the political/strategic levels to the tactical, using official records, accounts from commanders and participants, including interviews. The Author has conducted many battlefield studies and written extensively on the War in Italy. Doherty has done a good job here in putting together a narrative to cover a complex and challenging series of battles. It is a very good book on the Monte Cassino battles and the campaign in Central Italy in early and mid-1944, and as such, I am delighted to add it to my library. A very accessible and first-rate work, supported by good photographs and informative maps. Few battlefields of WW2 evoke such powerful images of destruction and death as the monastery on the dominant heights of Monte Cassino and few authors can be as well equipped to tell the story of battle with such clarity and authority. Richard Doherty has spent many years studying the Italian campaign, has explored every inch of the rugged Cassino battlefield and brings his sharp eye for detail to his analysis of this complex battle at the strategic, operational and tactical levels. 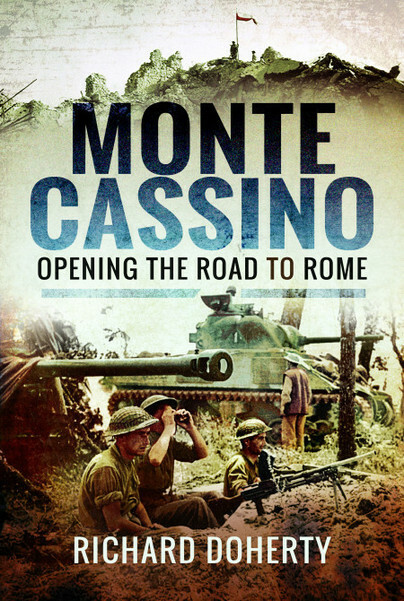 Monte Cassino – Opening the Road to Rome is highly recommended and the only book of the battle that the majority of readers would need. It is a well-researched account of the struggle to breech the Gustav Line and is full of thought provoking observations about the strategy, the battlefield tactics and the experience of the service personnel involved along with the competency of their commanders. Richard Doherty is Ireland’s leading military history author and it shows with this deeply researched book. It is impossible to do justice to his knowledge and perception in a single review, but suffice to say, from a military perspective, I very much doubt a better book will ever be written about the Battle of Casino. One of the leading military historians in the UK and Ireland, writer and broadcaster Richard Doherty has twenty-nine books to his credit, two of which were nominated for the prestigious Templer Medal. Chronologically his titles range from The Williamite War in Ireland, 1688-1691 to Helmand Mission: With the Royal Irish Battlegroup in Afghanistan 2008 and also include a history of the Royal Ulster Constabulary GC, The Thin Green Line. Over the years he has researched, written and presented several historical series for BBC Radio Ulster, presented two major historical programmes for BBC TV, for whom he has also researched and written historical programmes, and has contributed to, or advised on, many programmes for BBC Radio Ulster, BBC Radio Four, RTE (Irish radio and TV) and independent producers. His BBC Radio Ulster programme on the North African campaign, part of the Sons of Ulster series, was nominated for a Sony Award in 1989. He has featured twice in the popular 'Who Do You Think You Are?' television series, providing historical background for David Tennent (2006) and Paul Hollywood (2015). A popular speaker, he has addressed a wide variety of audiences in the UK, Republic of Ireland, France and Italy, as well as the United States, where he has lectured (on limited warfare) at the US Marine Corps Staff and Command College at Quantico, Virginia. Since 2002 he has been a guest speaker on cruise ships with topics ranging from military and naval history, including the Battle of the Atlantic, through Celtic history, to Irish myth, history and culture. He leads battlefield tours in Ireland, Normandy, Italy and Greece, writes historical articles and book reviews for newspapers, magazines and journals, is Chairman of the Irish Regiments Historical Society, a member of several military history societies in the UK, Ireland and the USA, a trustee of the Royal Irish Fusiliers’ Museum, Armagh and of the Royal Irish Regiment Museum, a trustee of the International School for Peace Studies, a trustee, and member of the Council, of the Northern Ireland War Memorial, and honorary historian of the Royal Irish Regiment.